Nairobi, 케냐의 와일드비스트 에코 캠프 | 호스텔월드에서 예약하세요. Wildebeest Camp is an oasis in Nairobi - the perfect place to relax during your African migration! The beautifully-appointed rooms and deluxe safari tents will be a welcome place to stay before and after your safari. 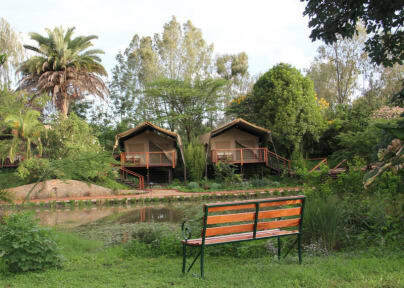 Only 8km from the city centre, this is Nairobi's first permanent tented camp, where you can enjoy peaceful tropical gardens, which are home to hundreds of varieties of plants and birds, while still being close to shops, markets, cinemas, banks and transport links. There is a range of accommodation to suite all budgets. 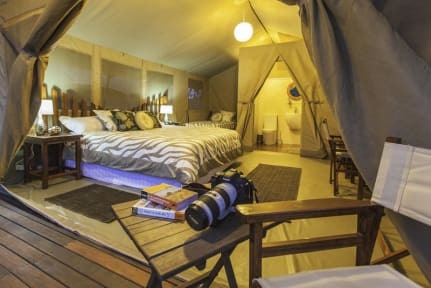 You can camp in the garden for only $7 per night or stay in one of the luxury ensuited safari tents for $30 per person per night - including cooked breakfast. * The price that you book on this site if for a camping pitch. If you need to use our tent and bedding this costs an additional 200/- per person. Just book the regular pitch and we will email you to ask if you will use your tent or ours. ** Please note that if you book camping, you have not booked the large permanent tents in the photos on the site. * Please note our dorm is mixed - boys & girls sharing. * These rooms are small and cheap. Ideal for someone who just wants somewhere to sleep but wants to enjoy the nice surrounds of the camp. We recommend guests coming from the airport use our pickup service. Once you have made your reservation, we will contact you with a confirmation and ask for your flight details or if you need a taxi from another destination.